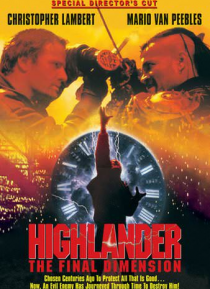 The last incredible chapter of the thrilling action-adventure series, HIGHLANDER: THE FINAL DIMENSION finds the immortal Connor MacLeod destined for a decisive battle with his ruthless eternal enemy, Kane. Pursued across time by his arch rival, MacLeod must make a heroic last stand if he is to rid the earth of the seemingly unstoppable Kane! Packed with intense action and astonishing special effec… ts -- the Highlander's greatest challenge will become your ultimate adventure!